The Orbital Sciences Corporation Antares rocket, with the Cygnus spacecraft onboard suffers a catastrophic anomaly moments after launch from the Mid-Atlantic Regional Spaceport Pad 0A, Tuesday, Oct. 28, 2014, at NASA's Wallops Flight Facility in Virginia. On Oct. 28, 2014, a commercial Antares rocket built by Orbital Sciences Corporation exploded just after liftoff at NASA's Wallops Flight Facility in Virginia. Here's Space.com's full coverage of the rocket mishap and its ensuing investigation. NASA and Orbital Sciences officials are warning the public to not touch any possible debris from Tuesday's Antares rocket explosion, and to call authorities if they spot any fragments from the blast. Orbital Sciences and NASA have issued a warning to the public to avoid contact with any suspected debris from the Antares rocket explosion of Oct. 27. Here's who to call if you think you've found some rocket debris. 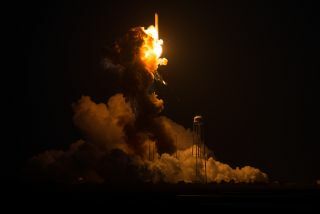 An unmanned Antares rocket and Cygnus spacecraft were destroyed shortly after launch on Tuesday night (Oct. 28) after a "catastrophic anomaly" that arose seconds after liftoff. Here's what we know so far. NASA and the Orbital Sciences Corporation have launched an in-depth investigation into the loss of an Antares rocket and its Cygnus spacecraft cargo shortly after liftoff on Oct. 28, 2014. The spaceflight company Orbital Sciences Corporation will launch its third Cygnus cargo mission to the space station on an Antares rocket. Here's how to watch the liftoff at 6:22 p.m. EDT. A wayard boat that drifted into the launch hazard area offshore forced Orbital Sciences to postpone the planned launch of its Antares rocket Monday night. The launch has been rescheduled for Tuesday, Oct. 28. Orbital Sciences will launch an unmanned Antares rocket and Cygnus cargo ship to the International Space Station tonight to deliver 2.5 tons of supplies to the crew there. Here's how to watch online. An Orbital Sciences Antares rocket is poised to launch an unmanned Cygnus spacecraft to the International Space Station Monday night (Oct. 27) and it may be visible to observers along the U.S. Eastern Seaboard. Here's how to see it. Check these visibility maps to see if you can see the Antares rocket launch on Monday night from your backyard.